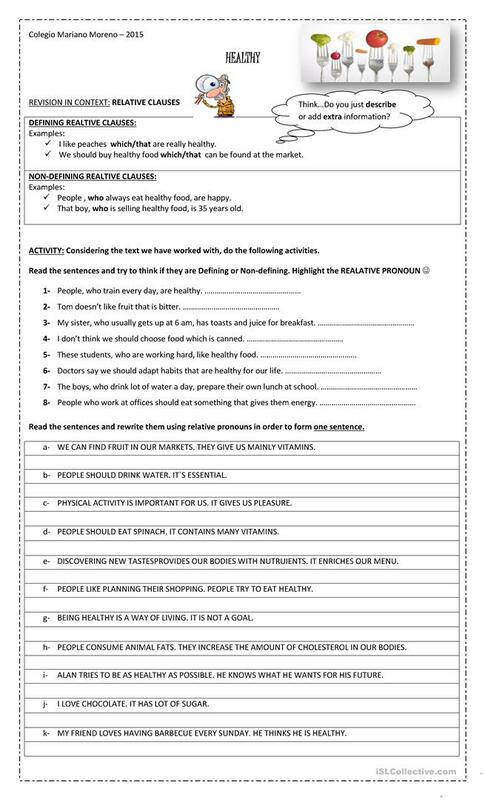 This worksheet is based on nutrition since the sentences to practise Relative clauses are about eating healthy, food,eating habits... Relative clauses practice included. Really usefull!!!! The above printable, downloadable handout is best suited for business/professional students, high school students and adults at Pre-intermediate (A2) and Intermediate (B1) level. It is valuable for revising Relative clauses in English, and is useful for enhancing your students' Speaking, Reading and Writing skills. It centers around the topic and words of Food.